Food Adventures of a Comfort Cook: The Enclosed Sandwich. Now while the Earl of Sandwich gets the credit for giving this one handed meal of bread, cheese and/or meat its official name; the concept was around for centuries before his birth. What's Cooking America.net gives a history going back to the 1st century, and the Earl certainly wasn't a spark in anybody's eye at that time. While the sandwich is an "open ended" meal, there are many cultures which have the "enclosed" sandwich, or meat pie. The Italian Calzone, the Cornish Pasty, the Mexican Empanada, Chinese Roast Pork Buns, and dare I say it...the American "Hot Pocket" are just a few. 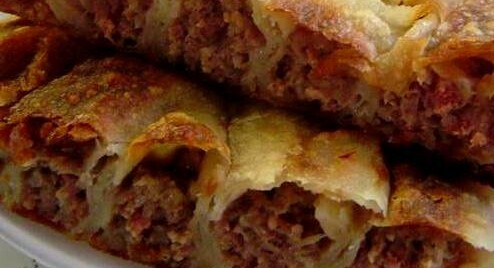 A crusty pocket of dough containing a filling of meat and perhaps cheese and vegetables, depending on the culture's tastes. A one handed meal, like the sandwich, but very unlikely the filling will fall, or be squashed, out from between the bread. The versatility of the meat pie is that it can be made with any type of dough, including pie or phyllo doughs which make a flakier pastry shell. In my family's culture, Croatian, there is a meat pie called Burek containing beef, lamb, vegetables and seasonings. Sold in bakeries, this is their version of "fast food"; an on-the-go meal that can be eaten with one hand and quickly. I like to make mine with phyllo dough which I can find in the frozen food section of most supermarkets; otherwise I use pie dough, as I enjoy the flakier crust more. Recently, via Facebook, I found relatives in Croatia that I never knew about, but we're all finally getting to know each other. So, I'm dedicating this blog post to them, and hope I've got the recipe correct and am doing them proud. In a large skillet, cook beef, lamb and onion over medium-high heat until meat is browned and onion is tender. Drain excess grease; stir in beets, parsley, paprika, black and red pepper, and egg; set aside in large bowl. In small saucepan, melt the ¼ cup of butter, stir in the flour to make a paste; gradually add in the beef broth, stirring constantly; mixture will thicken. Add this to the meat mixture, stir, cover and refrigerate for 1-2 hours, or until completely cooled. Preheat oven to 400F; spray a 15” x 10” x 1” jelly roll pan with nonstick cooking spray. To assemble: stack 3 of the phyllo sheets, brushing each one with the melted butter; cut stack in half, crosswise Repeat with remaining phyllo sheets to get 6 large rectangular stacks. Spread ¾ cup of meat mixture at one end, leaving a one inch margin; begin rolling the phyllo towards the other end, tuck in the ends to seal and place seam side down on the pan. Bake 20-25 minutes, or until internal temperature reaches 180F.